Ham and potato soup made in the slow cooker! 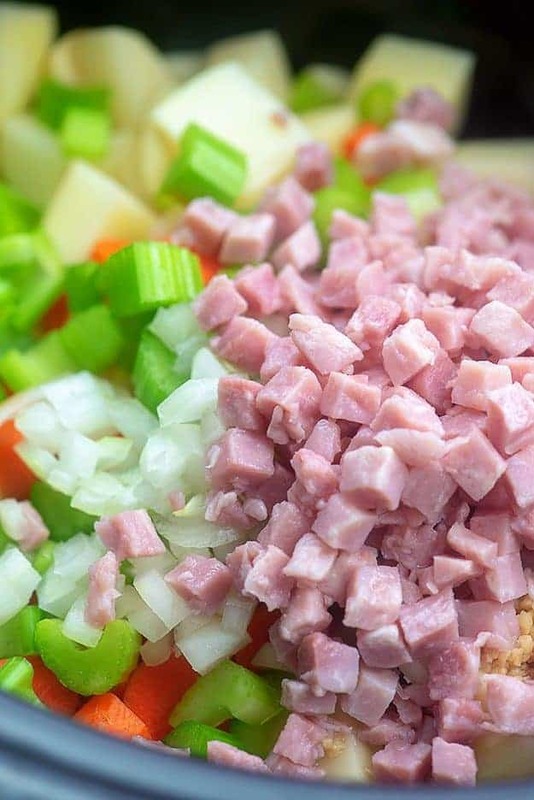 This recipe is the perfect way to use up leftover ham and it’s always a hit with my kiddos! 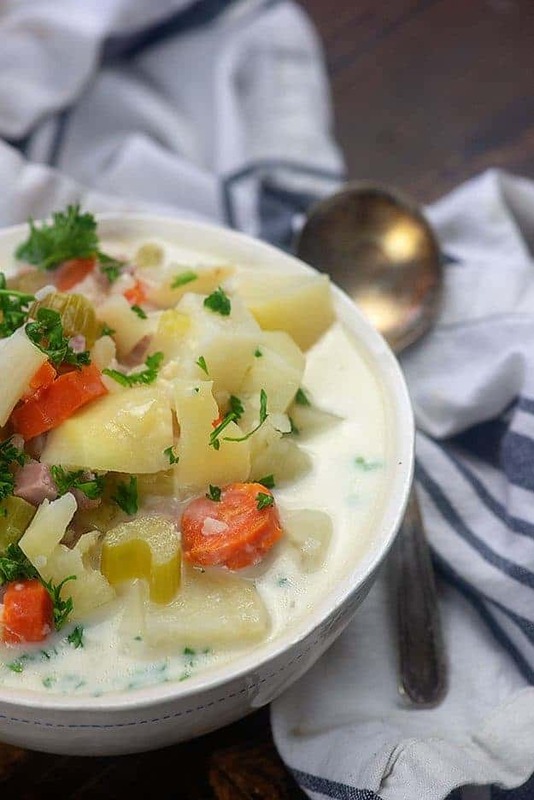 I get so excited when we have leftover ham in the house, because it means that I get to make this ham and potato soup! Of course, I’ve also been known to grab a bag of the already diced ham and just use that too. I mean, it’s just about the easiest thing in the world and it’s so versatile. We use it in omelettes, in soup, mixed in with my crockpot macaroni and cheese, and even for fried rice. 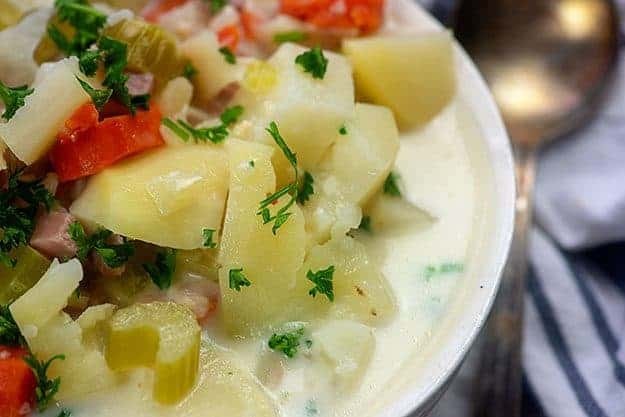 Whether you have leftover ham or you’re using the diced ham from the grocery, this ham and potato soup recipe is pretty perfect and you’re going to love how easy it is to whip up. Ready for the step by step? To start, you’ll peel and dice a handful of potatoes and add those to your slow cooker. Toss in some ham, carrots, celery, onion, garlic, broth, salt, and pepper. Easy enough right? Cook all that together on high for 3 hours or on low for 6 hours. Now, we’re going to make things nice and creamy! Add some flour and milk to a mason jar, seal tightly, and shake it all together. Alternately, add to a mixing bowl and whisk it up. This is such an easy way to thick a slow cooker soup. Pour that into your slow cooker along with some heavy cream and evaporated milk. Cover and cook on high for another 30 minutes. This should thicken the soup up nicely – it’ll be so creamy and delicious! Taste and add additional salt, if needed. Slow Cooker: The Ninja 4-in-1 slow cooker is my favorite and I have A LOT of slow cookers. I like the shape, size, and even heating of this one. Sharp Knife: Chopping veggies is a breeze with this knife. I have quite a collection of good knives, but this is the one I grab most often – a true favorite. 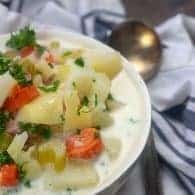 Crockpot Potato Soup: Cheesy soup perfection! Crockpot Broccoli Cheese Soup: So creamy and cheesy and it’s low carb too! 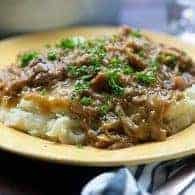 Crockpot Chicken and Dumplings: Pure comfort food. Cabbage Roll Soup: Hearty, filling, and simple. It doesn't get much simpler than soup in the slow cooker! 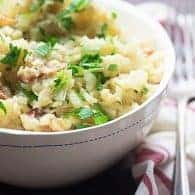 This recipe can be made with leftover ham or a package of the already diced ham from the grocery store. Add the potatoes, ham, onion, celery, carrots, garlic, salt, pepper, and chicken broth to the slow cooker and stir to combine. Cover and cook on high for 3 hours or low for 6 hours. Add the flour and milk to a mason jar, seal tightly, and shake well. Alternately, add the flour and milk to a small bowl and whisk well. Add the milk mixture to the soup, along with the cream and evaporated milk. Stir well to combine. Cover and cook on high for 30 minutes to allow soup to thicken before serving. 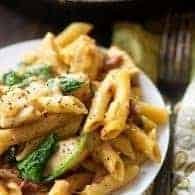 This recipe looked great. I love all the ingredients that go into that soup. 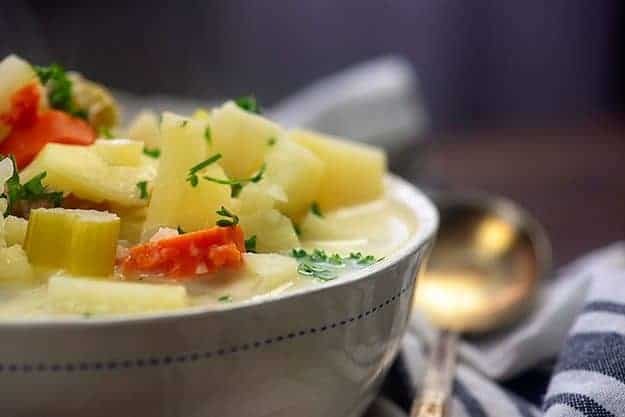 It is a great hearty soup for these cold days before spring really hits MA. I make one change in the recipe and used a hand held device that purees food and used that to puree the potato soup without the cubed ham, and added the cubed ham last, allowed it to cook for ten minutes before surving. My husband loved it as did I. He was never a soup person, but he now loves them. He used to “hate” Pea Soup, and now loves it, too, with or without the ham. Wonder of wonders, he even likes chicken soup! So cozy! I’m getting hungry just looking at these pics! 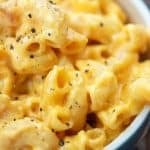 This recipe makes me hungry just looking at it! With Easter coming it’ll be great for the leftover ham. Thanks Karly!